The Dodgers finally make a return to the post-season on Thursday, for the first time since 2009. 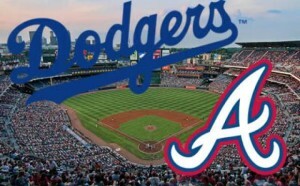 The Boys in Blue will be going up against the NL East Champion Atlanta Braves. The Braves finished 96-66, while LA was 92-70. Atlanta also won the season series with the Dodgers 5-2, but all of those games took place before LA’s historic winning streak. The Dodgers cooled off quite a bit in September, going just 13-14, but they may have caught a break. Atlanta cooled off just as much, going 12-15. Even though the Braves have home field advantage and the best home record in baseball, the Dodgers posted baseball’s best road record. This Dodgers have a major advantage here. In games 1 through 3, they’ll be sending Clayton Kershaw, Zach Greinke, and Hyun-Jin Ryu to the mound. The Braves will counter with Kris Medlen, Mike Minor, and Julio Teheran. Medlen is nice, but he’s going up against the best pitcher in baseball, and Greinke is the best #2 starter in the game. Any questions? The Braves have an explosive offense. They have a notable advantage at catcher with all-star Brian McCann, who has great power, more consistency at 3rd base with Chris Johnson, and in the outfield with Justin Upton and Jayson Heyward. Atlanta lead the National League in home runs, and they have two of the league’s top 3 hitters with Johnson and Freddie Freeman. Meanwhile, the Dodgers are missing some power in their lineup with Matt Kemp out, and Andre Ethier limited to pinch hitting duties. Even with Kemp, their offense has struggled to score runs in the last month. They’ll need Hanley Ramirez, Yasiel Puig, and Adrian Gonzales to come through. The Dodgers have quite a bit of depth here. Andre Ethier can supply some solid hitting off the bench, and Michael Young can come in to play either corner infield spot. Nick Punto is also a very solid utility player, who is capable of coming up with clutch hits. The Braves don’t have much here. Just BJ Upton, who has played more like Kate Upton this year. The Braves have had the best bullpen in baseball all season. They posted the lowest ERA in the majors, and suffered just 15 losses all year. Their bullpen is also anchored by Craig Kimbrel, who led all NL closers in saves and ERA. If he gets the ball, the game is over. The Dodgers bullpen isn’t exactly chopped liver though. Kenley Jansen, Brian Wilson, and JP Howell were lights out in September. The Dodgers are counting on their starters working deep into the game. The Braves are capable of hitting the ball out of the park, but they also struck out more than any other NL team. This means they sit back and wait for the long ball, instead of manufacturing runs. This could be big problem against the best starting pitching staff in the game. Remember, pitching has always been the great equalizer in the post season. The Dodgers will also have to start Skip Schumaker in center field, with Andre Ethier injured. However, Schumaker has championship post season experience with the Cardinals, and has even hit well against Medlen. If the Dodgers can return to the timely hitting we saw in July and August, they should be able to win this series easily. Dodgers in 4. This entry was posted in Dodgers on October 3, 2013 by omzzzzz.